V.com weekend vote: Did you buy your last instrument over the Internet, or in person? I'm imagining an old-fashioned image, of a violin in a shop window, and a child lingering, asking, "What is that, Mom?" Maybe a few months later the child starts begging to try that instrument. I wonder if, today, that window is a computer screen! Certainly, it's a different experience, to evaluate violin in person at a violin shop, or to evaluate it over the Internet. Buying a violin over the Internet can be a risky deal, but if you do your research, enlist the help of a teacher or trusted colleague, you can find reputable dealers on the Internet and find a decent instrument. Increasingly, commerce of any kind seems to be moving to the Internet, after all. And many companies allow you to test several instruments that they send, and decide between them. This is particularly helpful if you live nowhere near a physical violin shop or maker's workshop. Still, the experience of visiting a violin shop or a dealer's workshop is informative to all physical senses. Usually a dealer will also let you take a few violins home to test, but while at the shop, you can narrow down your options by holding the instruments, playing them, comparing them, and inspecting them from any angle. Sometimes I accompany my students when they test out violins at a local shop, just to help them narrow down their choices. It's a special chunk of time, in a special place. That said, I do live in a region with a number of high-quality shops. Another option is to start the process online, in which a faraway shop sends samples for you to try, before you commit to buying anything. For you, how did you choose your most recent violin? Was it mostly over the Internet, or did you go in person to a dealer or maker? I voted internet, though it sort of doesn't count as it was for my "travel violin" and I also called the shop as part of the process. I communicated online with a real-live shop, who sent me some violas to try, one of which I bought. Over the Internet. I discussed details 1:1 with the dealer over the phone as well. Had 2 fiddles sent here for in-home tryouts -- ended up buying one of them. Later had 2 others sent for tryouts. That was a tough call -- took me 2 weeks to decide between them -- finally ended up buying one of them as well. Still very happy. 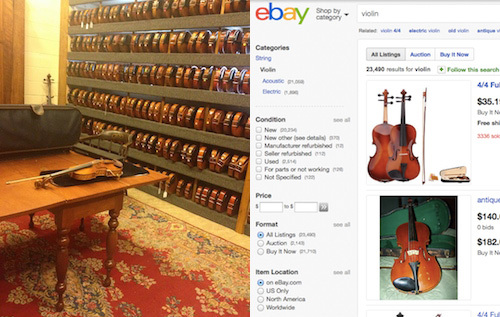 There is "internet purchases", that are run by regular violin shops. And then there are "internet purchases" made via EBay. My main violin was from the great shop near where I live (Blackerby's). My "BS-violin" (baroque style?) and my "don't care where I take it, and yes you can play it" fiddle were both from a known maker on eBay. And I had to put more money into both. Never again, my friend, never again. I commissioned an instrument from a well-established Luthier in my geographical area. She has a great reputation and makes only violins and violas. My violin was her 49th and is modeled after the 1730 "Kreisler" by Joseph Guarneri del Gesu. If I had not purchased an instrument in this manner, I would have gone to a shop so I could play before buying. I voted "another way" because I was not the one who actually picked out and bought the beautiful instrument I play now. My instrument was purchased for me by my wife. It was a gift for my 43rd birthday as well an engagement gift since we were getting married 3 months later. She bought it at an actual violin shop (The Violin Shoppe in Oneida, NY). She doesn't play, but the owner of the shop played several instruments for her in the shop. He knew me and had an idea of what I was looking for and price range, so he chose instruments that he thought I might like. After playing several different instruments including a 19th century French violin and an early 20th century Chekoslovakian violin, she settled on the newest violin he played. She made her decision based on the tone, what her ears liked, what just sounded the best to her. I would never buy any instrument online without actually playing the instrument first. I went to Italy and picked up my last violin purchase in person. But as for arranging the acquisition, I had communicated with the maker by phone and email. He emailed me photos of the raw wood, details of construction, and pictures of work-in-progress. So, I was kept in the loop throughout via the internet. My last purchased instrument was procured in the 1970s - before the internet of today was even imaginable to most consumers. I voted "Another way" because my violin was selected from instruments sent to my home from somewhere in Chicago. Several were mailed for trial, and eventually, I found the instrument I knew was meant for me. For my primary instrument, I would want an in home trial of at least a few days per instrument (unless it was immediately obvious that I didn't like a particular instrument). However - that said - I'm seriously considering an "advanced student" violin purchase - via the internet (from a reputable maker) - so that I'll have one for playing outdoors. I won't play mine outdoors per my luthier's advice. My last instrument purchase for me was a viola from a luthier. I went to several in the Denver area. However, using the internet I have purchased two instruments (beginner's) online from companies which which I have death in the past - note - these are companies from whom I receive catalogues and have purchased other items. These items were then given to a school after a local luthier (who I had talked to in advance) checked the set-up and then took them to the school. My last two violins were given to me by a friend (had belonged to her mother) after she had some minor work done on it, and one my brother had bought years ago at a garage sale (had belonged to his friend's mother) and I had it checked out and minor work (new bridge/rehair) and turns out that both are very good!! instruments - I was really lucky!!! Teaching violin and performing in the past. Well taken care of gift. There's simply no substitute for going to a shop and working through a bunch of fiddles. And furthermore there is often a long-term relationship with the shop, for maintaining your fiddle. Of course every shop is now doing the ship and ship back thing but still, the local shop has advantages. Like when you pop a seam etc. Laurie, I thought you had mentioned in the past that you lived on the West Side of Cleveland. Did your family take you to the Cleveland Heights area often to visit the violin shops? I don't get often to that area during my free time and it seems like all the professional shops are in that area and perhaps Murray Hill. It was ten years ago that I made my last violin purchase and I was tempted to go with the internet route. At that point I had only played on a single beginner violin up to Suzuki book 4 and had some music well memorized. I was close to a pretty good shop which offered over a dozen violin for intermediate to advanced players as well as dozens for beginners, all strung with Dominant strings. When I went to the shop, I had a room to myself and the freedom to try all the violins at all price points. As I played music passages from memory, and moved from one instrument to the next, it was then that I realized not a single violin was the same even between the same models. "Better" was really personal preference because I liked some better than others regardless of price. There is really no way anyone else can make that choice for you because how the instrument sounds or fits your hands or your posture are totally individual.